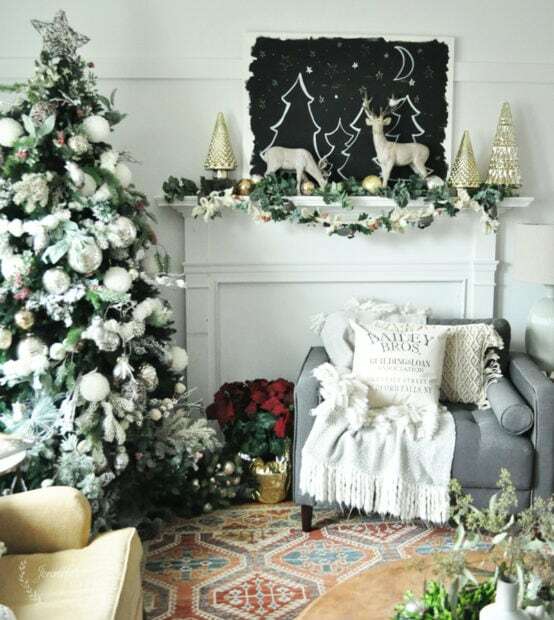 Welcome to my holiday home tour 2018! I am so excited to have you here, and be the first house on the house walk! We remodeled our kitchen, doing a lot of the work ourselves, 8 years ago, for about $12,000. Our rehab included painting our old oak cabinets, and adding a wood counter top, which has actually held up fairly well 8 years later. For my holiday decorating, I decided to go with a lot of natural decor and greenery this year. I may have to replace the greenery in a week or two, it depends on how fast it dries out and gets crunchy. 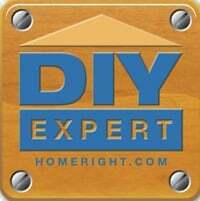 Next week, I’ll show you how I made the boxwood swag over the basement door. I just clipped branches from our yard. I hung a pretty mercury glass ornament wreath over it. 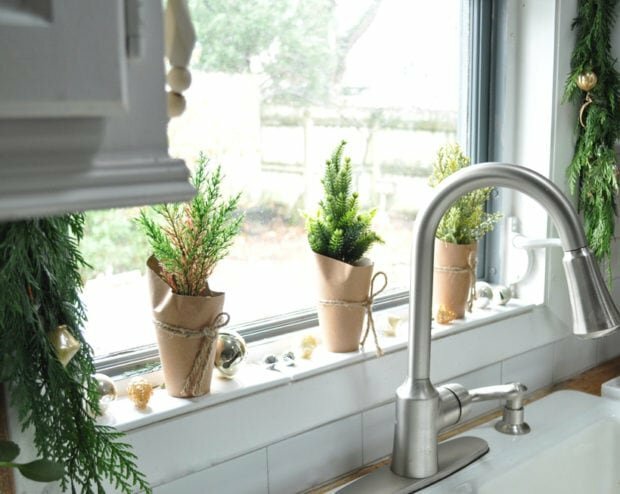 I love adding some holiday cheer to our counter tops, but our kitchen window is my favorite place to decorate. I love that we have a window over our sink. It makes the kitchen seem so bright, especially during the winter. 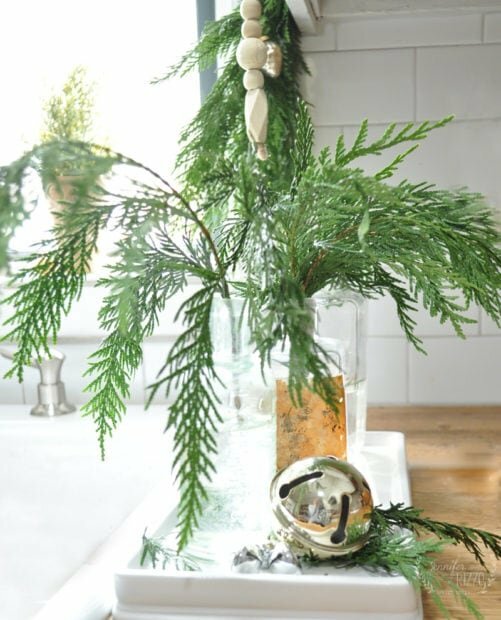 I added some cedar garland, wood beaded garland, and mercury glass ornaments to bring in some greenery. I have a few permanent white hooks in place, so I can hang various things in the window through the year. I brought some little green mini-trees from our shop, The Collective lhe + Makery, and scattered some ornaments on the sill for brightness. 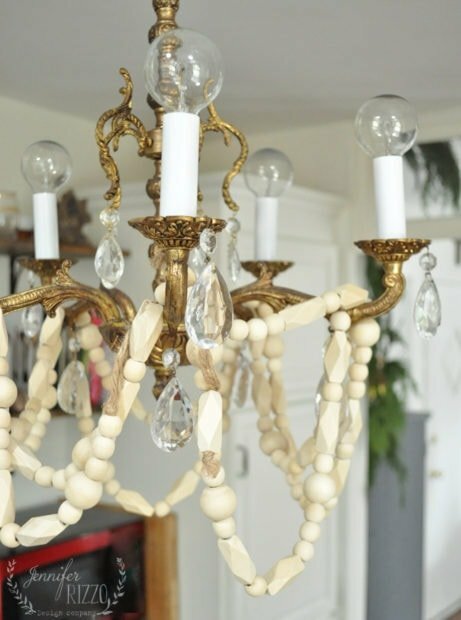 I also added some wood bead garland to the chandelier we moved. I might leave it there past the holidays. In the living room, I also kept with a boho meets natural decor theme. I still love this rustic modern mantel I did a few years ago with the same deer. The rug has so much color, it’s nice keep everything else fairly neutral. 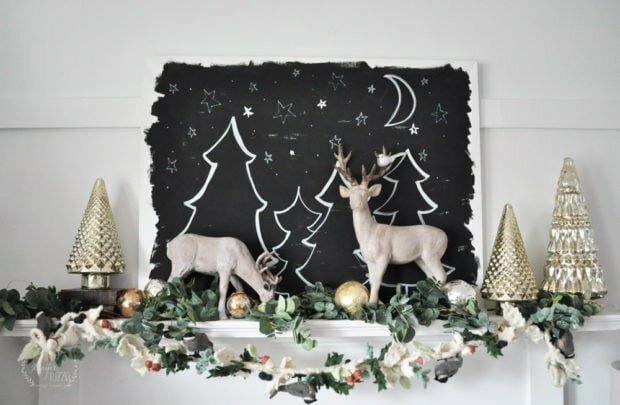 I loved being able to paint a picture as a backdrop for the reindeer this year on the mantel. We had a mirror up there forever, and I thought it was time for a change. 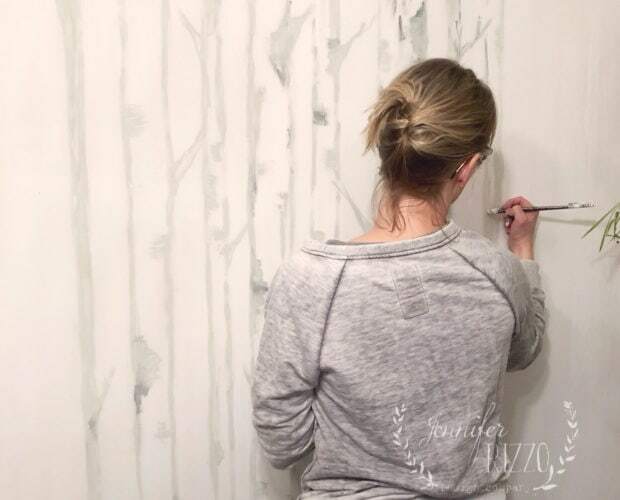 A few faux eucalyptus sprays, and mercury glass trees made the scene complete. Our tree has the option of white or multi-colored lights. I love the white lights, but the kids like to switch it to the multi-colored when I’m not looking. 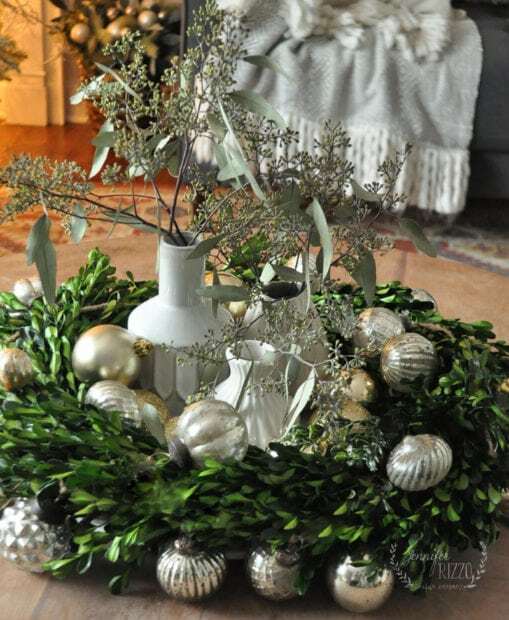 A boxwood wreath, with a few vases with seeded eucalyptus stems are a perfect, and easy centerpiece. 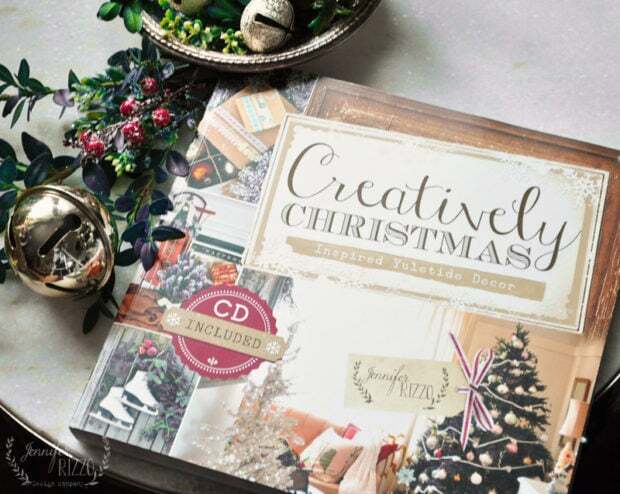 Of course, I use my Christmas crafting/decorating book as a holiday decor item as well! 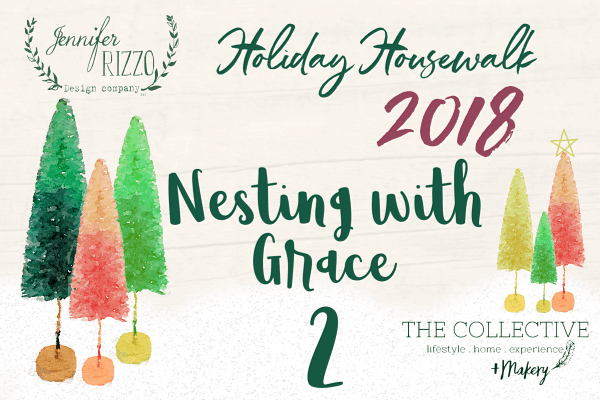 Thank you so much for joining my holiday home tour 2018 as the first house on the holiday housewalk! Need more holiday inspiration? Visit last year’s housewalk here. As always, you know how to deck your halls! I love your new kitchen island and that mantel is gorgeous! Wishing you the merriest of Christmases Jen! Thank you so much Kelly, and thank you for being a part of the tour with your beautiful home! 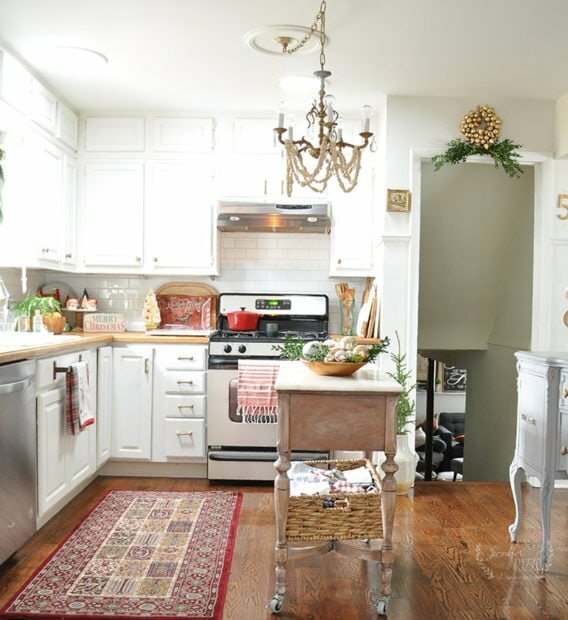 Your home is so cozy and warm~ Everything looks gorgeous, loving your mantel and beautiful kitchen window! Thanks for hosting such a fun tour! Happy day one Jen! Thank you for hosting another amazing year. I can’t wait to watch the week unfold. Love all the greenery and natural texture in your tour. Your fireplace and that soft wood coffee table were big faves! Thank you Shannon! Today was such a great start to an amazing week! So beautiful, Jen!!! Love your kitchen window! 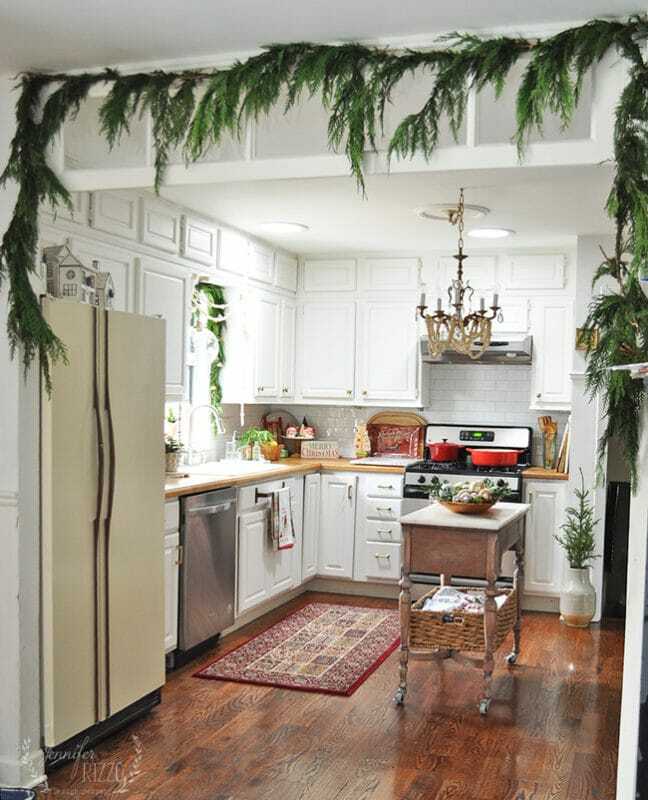 I LOVE all the garlands in your kitchen and can’t wait to see what you’re up to in the dining room!!! Thanks for kicking off my favorite week of the year on the blog. Thank you Laura, I’m so glad you are a part of it! Your home looks so beautiful Jen!!!! 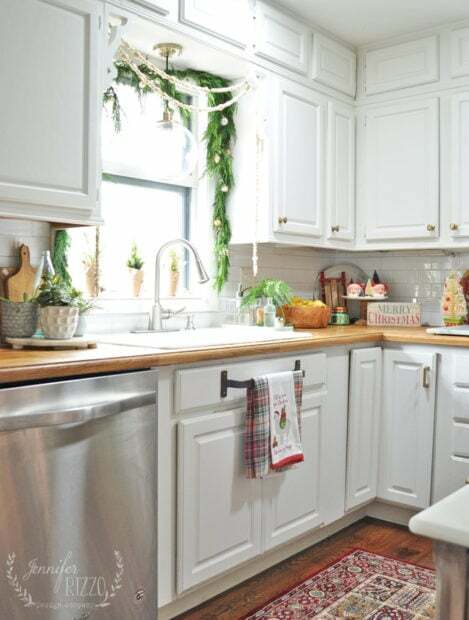 I love all the garland you used in your kitchen! Thank you for continuing to do this tour every year! It is my favorite!!!! It’s so beautiful Jen! I adore the painting behind the deer you made! So perfect! Thank you Annie! And thank you so much for being a part of it with your gorgeous home! beautiful, jen! 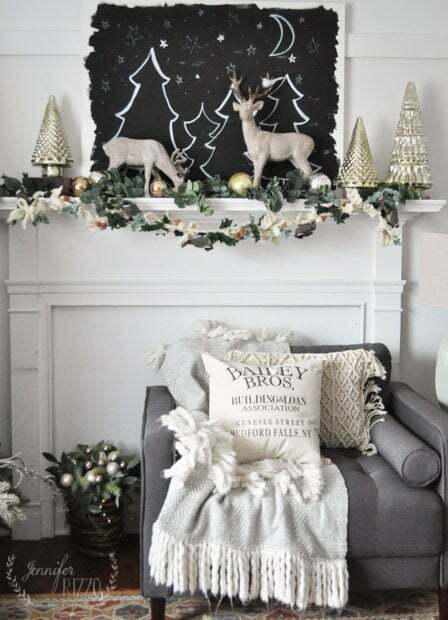 love the mantle and the garland in the kitchen! Where is the Bailey bros pillow from? I love it! I bought it at a vendor fair we did a week ago. 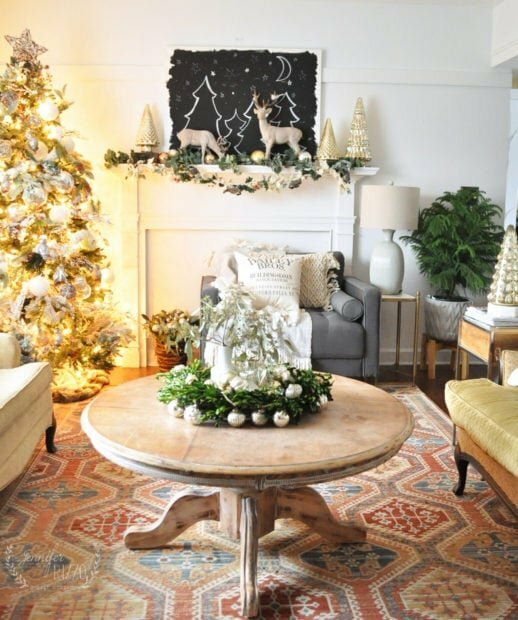 Very lovely Christmas home—and your painting dining room project looks fabulous, can’t wait to see it! Beautiful home! Just wondering where you got the kitchen towel holder on the cabinet under the sink. What a great idea! I bought it a few years ago at Schoolhouse Electric. It’s a towel bar for the bathroom, but I loved it’s chunkiness in the kitchen! 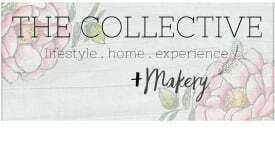 This is my first visit here, I’m hopping over from Courtney’s blog, and I’m so happy I did! 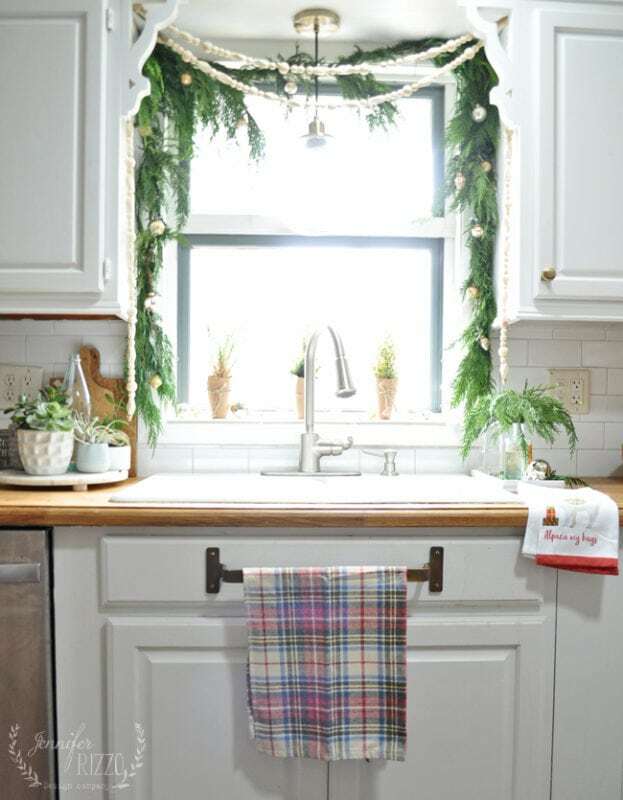 I absolutely love what you did with the kitchen window – I may have to mimic this idea for my own kitchen window next season! Thank you Debbie! I am so glad you loved the tour! Jennifer–Thank you so much for hosting your holiday tour every year! Your tour is as much of a tradition to me as watching Charlie Brown and drinking hot chocolate! I not only enjoy every home but find so much inspiration. Thank you again. Thank you so much Kristi! I love to hear that!